Preheat oven to 350 degrees F. Line an 8 inch metal square baking pan with nonstick foil or regular foil. If using regular foil, spray bottom with cooking spray. In a saucepan, melt the butter over medium. Reduce heat to low, add the chocolate, remove from heat and stir until chocolate is melted and smooth. In a mixing bowl, combine the eggs, granulated sugar, vanilla and salt without mixing. Just put them all in the bowl. Once they're all in the bowl, gently stir or whisk just until mixed (the point is not to beat in a lot of extra air). Stir in the melted chocolate mixture. When well mixed, stir in the flour. Spread a very thin layer of batter over the bottom of the pan to anchor cookies. Make 4 rows of 3 cookies (12) across the bottom of pan. Dot with a little more batter, then stack on another layer of 4 rows of 3 (12). Spread remaining batter so that you cover all the cookies. Sprinkle top with a little coconut if desired. Bake on center rack for 25 minutes. LET COOL COMPLETELY. Chill for 2 or 3 hours, then lift from pan and cut into 16 squares. 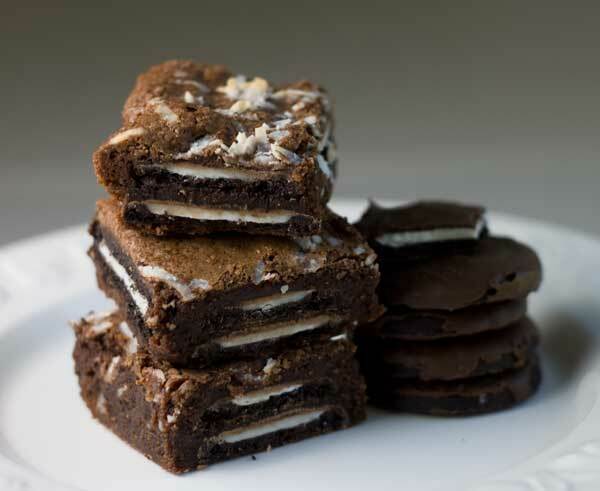 These are fudge-like brownies with layers of cookie and coconut filling. They're rich, but they should hold together nicely if you chill the brownies before slicing.